What a difference a week makes. While life is still crazy and over scheduled, I feel like we have made great strides in the classroom. Thanks for reminding us to take a moment each week and reflect, Ruth. Check out Ruth's blog for more weekly celebrations. We wrapped up our narrative unit in reading and writing and are moving on to NaNoWriMo and a Mock Caldecott unit for November. I was so proud of the students' writing. They were honest and wrote it all out for the world to see. I cannot wait to see their growth by May. I've been preaching to my students of late - share your story. If you don't, who will? That's one of the reasons I began this blog - to share my story. I think educators need to take back the narrative of education in this country. The folks currently telling the story of teaching in America are painting it with the wrong strokes. I'm grateful to get to share mine here and, by chance, on two podcasts of late. One is with the new podcast Stories from School. I love this series already. The episode with my story isn't out yet, but it is shared at the end of a bonus episode of one of my favorite podcasts ever - The Yarn. You can listen HERE while I tell the story of the impact of my first grade teacher, Jan Tuck, had on my life. The other podcast is another favorite. Kevin Carlson has a podcast called Re: Teaching. Conversations with Educators. With Kevin I got to talk about one of my favorite topics of late - the importance of story in reading and writing.You can listen to that HERE. I think reflection is critical, but when I'm stressed, it helps me also to think positively and look ahead to what is coming up that will bring me joy. When I look ahead, I see so much. I have a new student beginning Monday. I met he and his mom yesterday and he is wonderful. I cannot wait for him to join our classroom. Luke starts basketball season with a bang - six games from Tuesday-Friday this week. Yowza. If I can get out early enough on Friday, there is a cool fundraiser our local education foundation is doing that I cannot wait to attend. Liam will be joining a park district basketball team towards the end of November. He's excited to begin basketball as well. I have a presentation to give to interested folks in my district in a few weeks and then it's on to NCTE. I cannot wait to see friends in Minneapolis and get the chance to talk books, kids, and teaching. 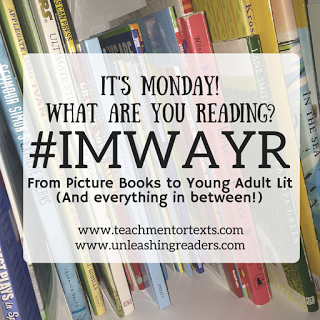 I'm thrilled to link up with Teach Mentor Texts and Unleashing Readers each Monday and share our reading lives. Check out their sites for more information. The Odds of Getting Even is another story with Mo and Dale. This series began with Three Times Lucky and then moved on to Ghosts of Tupelo Landing. My students love it, and I loved this book. Nimona is a graphic novel from one of the same authors of Lumberjanes. This one is on the National Book Award shortlist. While it is too old for my classroom, I love the book. One of my favorite graphic novels of the year for sure. The two picture books I read this week were both brilliant. Thank You and Goodnight has several nods to classic bedtime stories. My students loved picking them out. 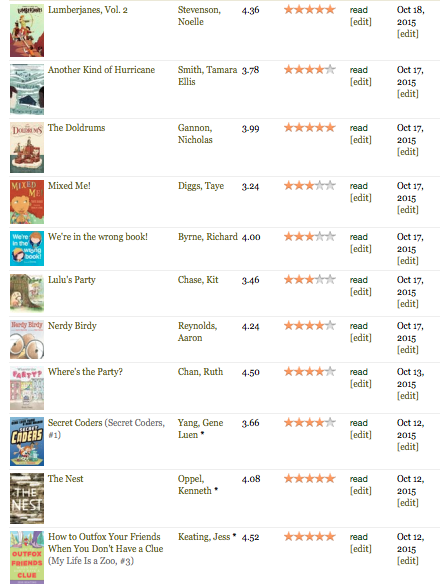 Finding Winnie has joined Fine Dessert in my favorite picture books of the year camp. I absolutely loved this one. The Hired Girl I had put off reading forever. I'm not sure why, but I didn't think I would love it. I fortunately have a friend who apparently knows me better than I know myself. She read it recently and told me to get moving. This book brought me back to classics my mom had me read growing up - Anne of Green Gables, Daddy Long Legs, and more. I LOVED it! Finally, Kate Messner has a new one coming out next year called The Seventh Wish. Brilliant. One of my new favorites from Kate. This deals with friendship, family dynamics, and addiction in a way I haven't seen done before. I loved it. I don't have enough words to express how much I loved it. I will write a review post closer to the publishing date, but please put this one on the list to purchase this spring. This week I'm making a goal of reading three professional books. I have several I want to buy at NCTE, but I'm requiring myself to read the huge stack I currently own first. Beginning with Lester Laminack's new book seems like a great way to start. I cannot wait. Man alive, if ever I needed Ruth Ayres' weekly celebration, it is this week. I listen to podcasts early each morning while I walk Rosie. Last week I heard someone mention the "October Blues" that teachers go through. That really resonated with me. You go, go, go all through August and September, just trying to get the year started. Then, October hits. I feel like it is never "enough." I cannot teach enough, find enough time, be present enough, etc. It is a struggle. Last year was my first year I had reading and writing to teach to all three of my classes. Previously I had taught reading only to all three, writing to my homeroom. I lamented all year long that I didn't have enough time. This year? Ten minutes less each day. It is not enough. And yet, it is what it is. I'm trying hard not to stress. To know that what I do matters. But then I look at what I haven't covered yet instead of what I have and I worry. Ugh. This morning, however, I am choosing to find time for celebration. I am celebrating what has mattered this week. Celebrating what good can come from the bad. That is what matters. That is where I will find room to grow. My son, Liam, didn't make his fifth grade travel team. He was crushed. I was crushed for him. But today I'm celebrating the fact that he will find new ways to grow, new teams to be on. That he has learned that failure does not define who we are. He (and I) will grow from this and be stronger. I celebrate Liam becoming who he is meant to be. I have many students who have experienced tremendous loss in the past year. The loss of a parent or loved one is the greatest fear of most children (and adults). I hate that they have had to experience this as children. However, I am so proud of these kids. We are in the middle of our personal narrative unit. Many of them have chosen to write about this. While this has been the hardest and most gut-wrenching writing conference of my teaching career, I am so proud to sit beside them and try and help them write through this. I celebrate their bravery. I am not near as far along this year as I have wanted to be. It is easy to see the holes, the items not crossed off on my "to do" list. Tuesday was the National Day on Writing. Many people were sharing on social media the importance of writing under the hashtag #WhyIWrite. I opened it up to my students on Padlet, asking them to share their thoughts. When I sat down to read them at lunch that day, I cried a bit in my car. They got it. They truly did. That is all the growth I need at this point in October. We may not be where I wanted to be at this point, but we will get there. Of this, I am certain. So, to wrap up, I celebrate these brave voices below - my fifth graders. I read a lot this weekend. 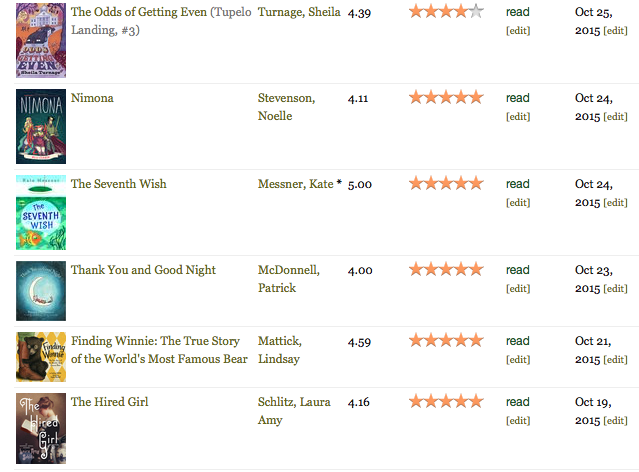 I needed to read three books: The Doldrums, Another Kind of Hurricane, and The Hired Girl. But I also knew what my schedule looked like. (Insane as ever.) So my sure way to make sure I accomplished that reading? I told my homeroom class that they had permission to give me tons of grief if I didn't finish. They were glad to take on that challenge. And it was in that conversation I realized how far we've come this year. Several kids asked what books I needed to read. In sharing them one asked if the illustrator for the cover of Another Kind of Hurricane was the same as the cover illustrator of May B. I didn't know, so we checked May B. and I promised to check the other book when I got home. (They are the same.) This led to a conversation about illustrators and authors, a conversation about why I had put off reading The Hired Girl, and reassurances from my students that they knew I'd find the time this weekend. 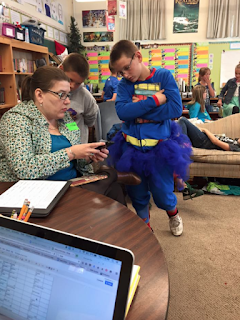 "Steal minutes, Mrs. S. I beg you can find time while waiting in line," one child told me. Recently while listening to a podcast I heard an educator refer to October and say it is when teachers get "the October Blues." That made sense to me. The year is finally settling into a routine. The craziness of August and September have past. However, now I can see where I wanted to be by now, and know that I am no where close. It's easy to think you've failed. The kids have settled in too. The honeymoon period has passed and they are absolutely willing to show you their true selves. My heart is heavy with burdens of theirs that I am trying to carry for them, to lighten their load, but there is only so much I can do. I have such an issue with that. I want to "fix" everything. I want each student to go home to a happy house, with an entire family, with enough food, with enough love, with, with, with. Life is hard for kids today. Life is hard for me. I need to remember that. Today I vow to put aside my October blues, remember how far we've come, and grin as I tell my homeroom kids this afternoon that I read them all. And I will try and remember, I've got this. So, what did I read this week? A lot. And I cannot wait to share these titles with my beautiful students. We've come so far already. 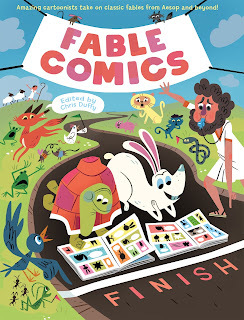 Graphic novels are HUGE in my classroom, which is just one reason I was excited to enjoy the Fable Comics blog tour. Some of my students are familiar with fables, many are not. Having them in the graphic novel format makes them so much more accessible to my students and gives them a desire to learn more about other fables. Today I'm excited to interview the author of one of the fables inside of Fable Comics, Roger Langridge. My questions are in purple, his answers follow. Enjoy! What brought you to creating comics? Were you a comic reader as a child? I essentially learned to read from the Disney Duck comics of Carl Barks, which my mother used to give to my brother and me when we would go on long car journeys in order to keep us quiet. I started reading comics then and I’ve never really stopped. When I was around six or seven years old, a teacher gave my class an art assignment to draw a comic strip. Most of my classmates drew a three- or four-panel strip, but I took the strip of paper we’d been given and covered it with 16 or 20 tiny panels on each side. I’d found my thing! From then on I never seriously considered doing anything else with my life. What advice would you have for my students regarding writing and drawing? Do a lot of it! Just be as productive as you can, because the best way to learn is by doing. And try to find the part of the process that is the most fun for you and build outwards from that, so that writing and drawing becomes the thing you most want to spend your time doing. Are there any fables you remember as a kid? What did you make of them? I’m sure I was exposed to them as a kid - I vaguely remember the one about the fox wanting a bunch of grapes - but I’m not sure they made a huge impression on me. Lots of interesting stories that I didn’t necessarily feel a great connection to, but which are useful to have rattling around in your noggin, because they’ve seeped into the wider culture so much. One of the wonderful things about the Fable Comics project is its mission to make these stories feel accessible! How was working on an anthology different than working on your own project? Obviously, it’s much shorter! I like working in anthologies, and on shorter pieces generally, because it gives me a chance to try things out (for example, new inking tools or coloring techniques) and see what happens in a way that would be much more risky in a longer project of my own, because if it all goes wrong in a longer project you’ve committed yourself to months of frustration and struggle. With a nice little two-pager like this, you’re in and out again. It’s like a refreshing dip! Regarding your fable in Fable Comics, Demades and his Fable, how did you make the decision to tackle it? Was this a fable you were familiar with before this project? The fable was assigned to me by editor Chris Duffy. I think, because I came on quite late in the day, it wasn’t so much that I chose this fable than that it was chosen for me; it might have been the only one that was left! I hadn’t heard of it before it was offered to me. I hope I understood the gist of it well enough and didn’t mangle it too badly. Chris didn’t write me an angry e-mail after I turned it in or anything, so I might have gotten away with it! From classics like “The Tortoise and the Hare” and “The Grasshopper and the Ants” to obscure gems like “The Frogs Who Desired a King,” Fable Comics has something to offer every reader. Twenty-eight fables from different cultures and traditions are wonderfully adapted and illustrated in comics format by twenty-six different cartoonists. Edited by New York Times bestselling Fairy Tale Comics’ Chris Duffy, this jacketed hardcover is a beautiful gift and an instant classic. Both A Curious Tale and Paper Things were on my Mock Newbery (HERE), but I hadn't read them yet. Excited to head back to school tomorrow, I know several kids that will love these books. Three left on my list that I must read. I'm starting this week reading The Nest. I've heard a lot about this one and can't wait. I have a hard time creating a Mock Newbery list. A very hard time. So hard that when I began working on my list, there were sixty titles on there. No exaggeration. It is agonizing. Sheer torture. I add titles, delete some, add a few more. There are several top books that I love, that I believe with my whole heart might be books that are being debated by the Newbery committee this year, yet I don't think they are a good fit for my students. And so I leave them off. Then there is the issue that I haven't seen everything yet. Books are still coming out, for Pete's sake. There are books out there that I haven't even read yet. (This thought keeps me awake at night. Just one more page.) In that vein, there are five books I haven't even read yet. I know, I know. That's crazy. But in pouring over reviews, looking at other Mock lists, I had to add them. Originally, there were ten I hadn't read, but I read five in the last two weeks, five left. 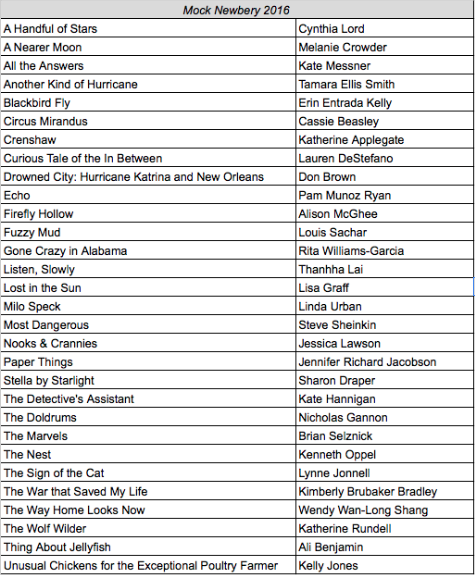 My goal in creating this list was to find twenty books I felt were good contenders for the Newbery, good fits for my students, and would expose them to a wide variety of what was out there this year. There are many, many, books I love this year that are not on this list. I had to cut somewhere, and this is where I landed. I share this list not to say these thirty - yep, thirty, I couldn't stop at twenty - these thirty are my top books of the year. That list is much longer. 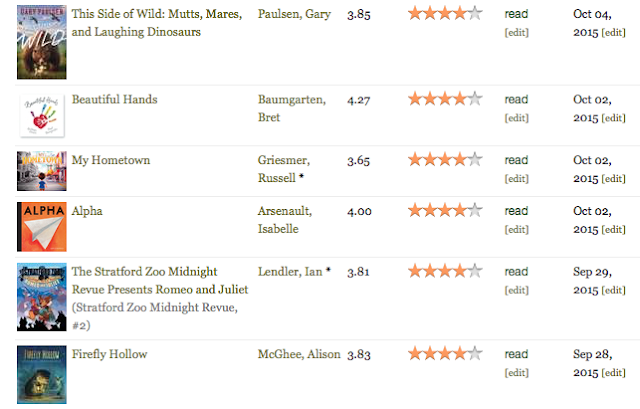 These are the top books for my Mock Newbery. Period. They are great books in so many ways. I hope that by sharing them, you find some new books to try and maybe a new favorite or two for yourself. In case you are wondering how I run this club, a quick word about it. The Mock Newbery is casual. My entire goal is to get kids talking about and discussing these books. We meet four times before the ALA awards. Meetings are once a month in my classroom at lunch. The kids bring their lunch, I bring a dessert. We talk about what they read that month and I allow them to award points to the books they are loving right now. For the first month, they have five points. They can give them all to one book, or split it amongst two (or more.) Each month, they read more books and get more points to award. To attend, they have to read one contender a month. That's it. We have a blast. So, without further delay, here are the books we will be discussing this year. Enjoy! 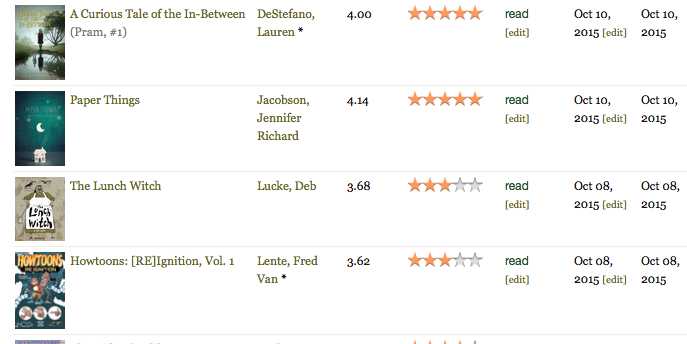 ** FYI, I don't believe Kenneth Oppel's The Nest can actually win, because I believe he is Canadian. That being said, it is still included on our list because the reviews were that good. I wanted the kids to read it. We will be discussing this aspect of the award too. I was reminded of the importance of mercy this weekend. On Sundays I teach CCD to my oldest son's 7th grade class. We've talked a lot about how Pope Francis has declared next year the Holy Year of Mercy. We've spent time deciding what mercy means and what we can do to embrace it as we spend our 7th grade year together. This past Sunday, I made them write about it. I hadn't realized I would be teaching CCD last year until the year began. I've always said that I'd leave it to someone else, that I teach all week as it is. But they needed a teacher, so I did. This year I had more time to think about it, to prepare. I decided to bring my fifth grade classroom in. We'd have writing notebooks, quick writes, and more. Three weeks in, I love it. Sunday I asked my students to pull out their notebooks. I asked them to reflect on what we've written so far about mercy and forgiveness. And then I asked these kids, these big seventh graders, to be brave. I wanted them to be honest. For two minutes I wanted them to write about themselves. I asked them to consider the following: If they stood in front of their entire class, what would those kids say about them, if they were being uncensored? The pencils flew. I saw heat spreading towards faces as these kids, kids I knew and loved when they were fifth graders, wrote. I could tell that some of what they were writing, they didn't like, but they wrote. Two minutes were up. They looked at me. I asked them to draw a line under it and write again. This time, I said, please write what you want people to say about you. Again, the pencils flew. After two more minutes, I looked at these wonderful faces I adore. I gently reminded them that on this journey of mercy and forgiveness, the first person we need to forgive is ourselves. Seventh grade is such a tough time. I think it is a time of low self-confidence and doubt. A time where friendships can feel precarious and you are just trying to find your way. 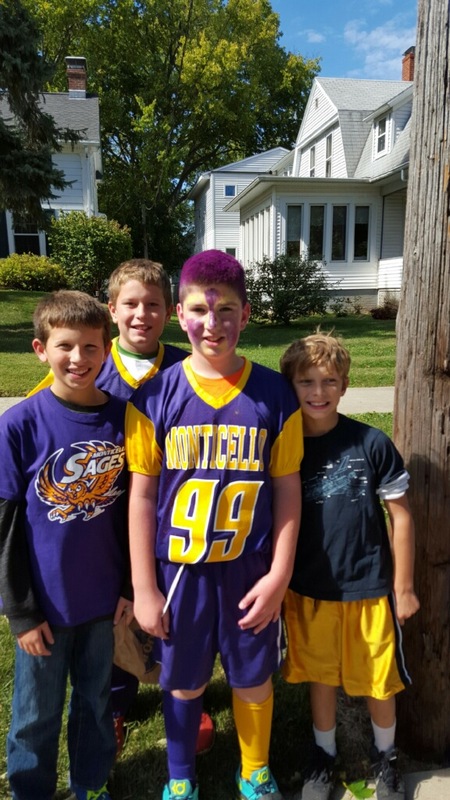 I reminded these kids that we all screw up, but owning up to that is important. Forgiving others is important. And so is forgiving ourselves. They needed to be the recipients of mercy first. How long it is taking me to confer with all of my students. The fact that my first unit took two weeks longer than I planned. That I sometimes need to read two picture books in a day to catch up with our classroom #bookaday. That someone tweeted a poop emoji in our class Twitter account. Again. That, to be honest, I think the emoji is hilarious. That I cannot make it through a week - or a Monday - without tearing up in front of my class. We've had an emotional day, and I think it's good to see that a teacher cares, but some days, I wish I could hold it together. That I've created another weekly reflection sheet. I wish I could pick one and love it, but I always seem to want to tweak. That there are not enough minutes in the day, days in the week, and weeks in the year for what I want to teach. That I will always put the emotional needs of my class above any set of standards invented. And, if I'm being completely honest, I don't think I have to forgive myself for that last one, but it is something I think about often. Think about what is eating away at you. Forgive yourself. If you are there for your kids, if you are putting them first, you're doing what you need to do. The rest will come. This past week was busy, crazy busy. Four nights of football practice and two football games for my boys. 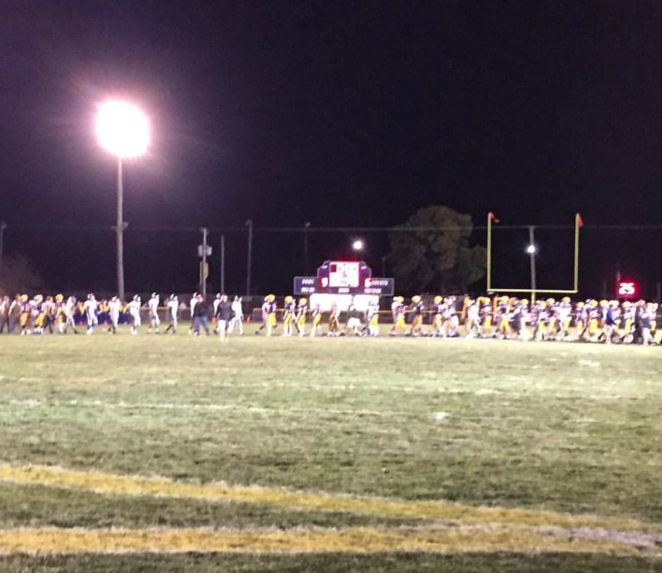 One game for the High School - homecoming. Spirit week all week with crazy theme days each day. A great visit with a friend to my classroom on Thursday. 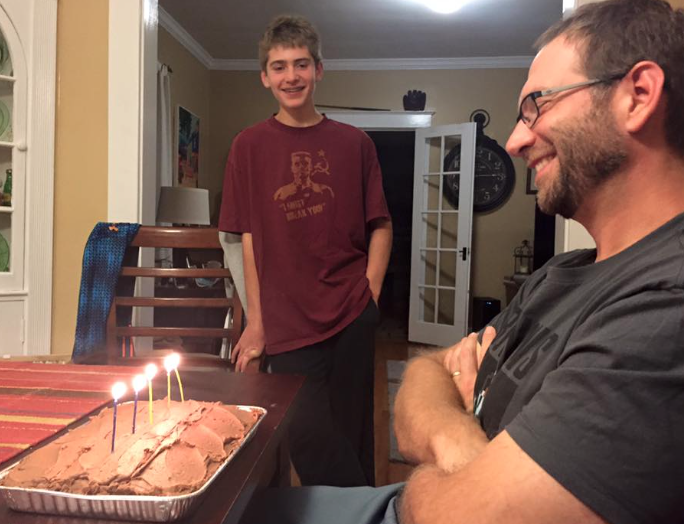 My husband's birthday on Thursday, celebrated Wednesday because I'd be gone. And a wonderful conference in Peoria on Friday. But truly, it is not all that different from every other week. They are all busy. I think it is the new normal. Everyone is busy, and there is nothing I would change about it. I love it all. I have just had to get really good about carving out time to read amongst the craziness. I'm glad to say that this week, I did. These books are fabulous. This Side of Wild and Firefly Hollow are on my Mock Newbery list. I loved the first Stratford Zoo graphic novel. This one was just as good. And while all three picture books I read while standing in a bookstore were good, I did end up purchasing Beautiful Hands and My Hometown. I am currently teaching a unit on personal narratives and I think they will fit right in. I have so many books on deck this week to read, I'm not sure where I'll begin. As I mentioned yesterday, I attended the annual IRC conference in Peoria this week. While there, I was discussing with another educator the merits of teachers leaving the classroom to attend professional development. He shared that he knew of a school where if you didn't miss any school - illness, personal day, or professional days - during the school year, you were given money at the end of the year. To say this irritated me would be an understatement. It felt like one more way to devalue our profession. Are other professionals encouraged to come in sick? To send their sick children to school or find other people to stay with them? To purposefully save any growth as a professional until them summer? I simply don't understand. And while I sit here and type, with a box of Kleenex next to me thanks to my beautiful students who enjoy sharing, I thought I might share what I gained by missing a day of school on Friday to attend a reading conference. I had the pleasure of attending four sessions on Friday; three with Penny Kittle, one with Donalyn Miller. I have seen both of these amazing women present before, but I would go again and again. Their message is always inspiring and I walk away with new thinking as well as clarification on what I am already doing. Penny inspires me as a reader and a writer. She shares passionately her belief that writing in front of her students is critical to their success. Penny uses quick writes in her class as I do, but what she reminded me was the importance of writing in front of them. I often write to the side while my students are writing. She suggests writing under the document camera so they can see what you are writing. It helps to spur on those who are stuck. My favorite part is that she then goes back and rereads her own writing while the kids watch, revising as she goes with another color of pen. She then asks her students to do this work as well. They see that revising makes the piece stronger. That revising isn't just looking for spelling, capitalization, etc. Writing together connects Penny with her students. At one point she threw out the idea, "What if there was a quick write with a chance to talk at every faculty meeting? I bet that we would be stronger as a result. Definitely better friends." That would be powerful. I'm sure some would hate it. However, I know that would be a faculty I would want to be part of. Penny also shared the importance of mentor texts. I know this. I love it. I've learned about this through the works of Katie Wood Ray and Ralph Fletcher. I am grateful to be reminded of it once again. Penny looks for mentor writing while she read, saving favorite sentences and passages in Google Docs to reread with her students. I also loved the reminder to have our kids looking for brilliant sentences as they read. I've had my students do this before, but it has been awhile. Gathering those sentences and posting them in the classroom allows us to be surrounded with beautiful language. So important. Finally, Penny reminded us about the importance of choice in reading. Her book, Book Love, speaks to this. She talked about the kids who had used Spark Notes to make their way through high school, and how they finally found books that spoke to them when they were allowed to choose their own books. This isn't to say that she still doesn't use a whole class novel, she does use on a semester - only for 3 weeks. The rest of the time they are creating their own book clubs and selecting independent choice books. I loved the powerful stories she shared - both with students and teachers. At her school someone teaches a class called Literature in War. He went from a semester of all assigned texts to a plan of one assigned and discussed - Maus, then four books as a choice for book club, and then independent choice in this genre. The kids were so excited and engaged that they ended up adding the second book of Maus, ten total options for book club, and then their independent choices. The students read and discussed far more than normal and the teacher said he would never go back. It was the most engaged he had ever seen students. This is what happens when we give them choice. Scaling back from completely teacher driven to one piece that was driven by teachers and then handing over the reins and letting the kids chose. I only attend one session with Donalyn before having to dash off for home. The topic was conferring. Critically important stuff here. Donalyn reminded us that conferring is critical to seeing all of the students in our classrooms. That we needed to find whatever system for conferring that worked for us, one that we wouldn't give up. I love, LOVE, her "Golden Gate Bridge" method of conferring. It seems that the folks that paint the Golden Gate Bridge start on one end and paint their way across. Because of the climate and salt water, they are never done. Once they reach the other side, they begin again. So Donalyn's advice in the classroom is the same. Keep a copy of your class list, check off as you confer, begin again once you finish the class. She tells us to stop beating ourselves up because we haven't met with seven kids in a day. Value the one you do meet with. Donalyn has three types of conferences. One is an assessment, check-in type where she checks to see if they understood a skill that she's taught. She uses this one less frequently. A comprehension conference that takes more time, but tells her a lot about if the students are understanding what they are reading. She uses that one about four times a year. And then a reading habits conference - what they're reading, when they're reading, who are they recommending books to and getting recommendations from, etc. This one is built around the habits of readers from her book, Reading in the Wild. I love conferring with my kids, but I am just now settling into a nice conferring schedule (as in the last three days). The start of the year I feel like my conferring would fall into the "putting out fires" type of conferring. Getting one student on track, helping another find a book, etc. I'm going to leave you today with some quotes I jotted down from Penny and Donalyn. They were inspiring to me, I hope they will be to you as you start your week off. What an amazing day. Teaching is not a symphony, it's jazz. My students' writing rests on a foundation of reading. Living as a writer with my kids is the single most important thing I do. The number of books a child reads in a school year is the most important thing they do in their school year. It has the largest impact on their future. How easy it is to think the book is important. It is the student that is. You aren't preparing kids for anything if you aren't marching kids through books and they aren't really reading. If we have kids that aren't reading, we have to own that. They are our kids. If we control 100% of what they read in our class, they read less. Conferring with our students ensures that we have no invisible children in our classrooms. We really only know what kids think about what they read in two ways - what they write about it and what they say. Many students walk into reading a series non-readers and walk out of it readers. Ruth Ayres reminds us to look for the small moments to celebrate each weekend on her blog. (HERE) Sometimes I need that reminder more than others. Not this week. It was amazing. This week is one of my favorites of the school year. It's also insane. With Homecoming on Friday, we have Spirit Week leading up. 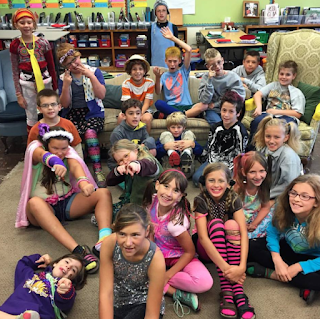 Each day has a different theme and the kids dress up for it. To say it has a different vibe than the other weeks in the school year would be an understatement. To say you are competing for their attention would also be fair. But I love it, and not just because I get to wear jeans each day. 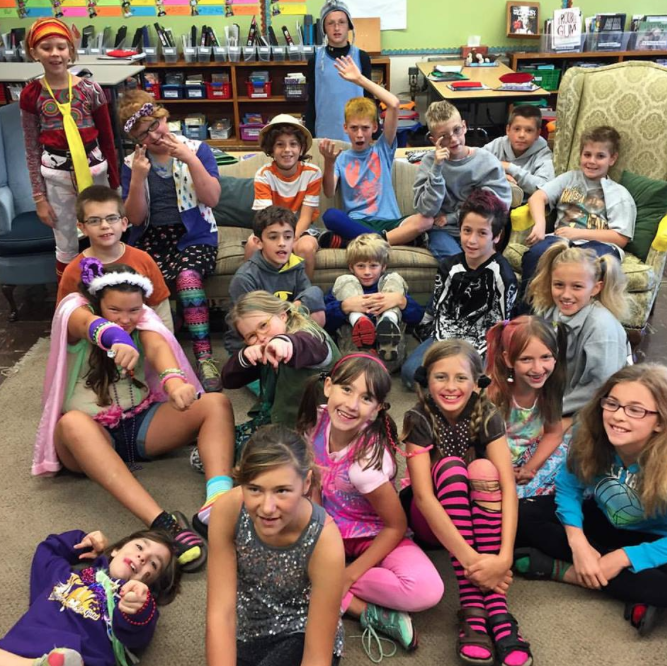 Spirit week rocks! I know I love the folks I teach and work with, but this week showed me that even more. People covered my class so I could run to the doctor to see if I had strep throat. (Nope, just a cold and allergies.) I had folks step in to help get copies for my substitute on Friday because I ran out of time. A colleague that works in the tech department helped me troubleshoot on the iPads. And a teacher on my team sent me photos from the parade when I couldn't be there. So many amazing friends that I'm blessed to work with each day. Chris's birthday was on Thursday. In honor of it, I left town and went to a conference. Seriously? I'm so grateful that he was fine with that and knew that it was something I really didn't want to miss. We did celebrate with some cake and pizza before I left. The Homecoming Parade is one of my favorite parts of the school year. I would only miss it for something equally amazing. 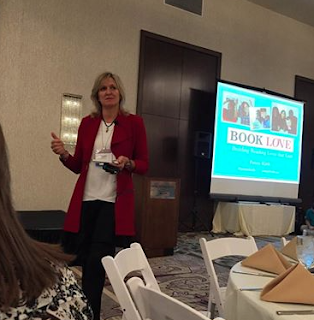 Heading to the IRC conference and listening to Penny Kittle and Donalyn Miller for the day? Worth it. I'll write up a post tomorrow about what I took away from it, but the one thing that I'll say here is how valuable it was for me. In a conversation at IRC, a new friend was telling me how districts are discouraging teachers from taking days off during the year. Providing incentives if you don't miss any time. I am a better teacher for attending professional development. I am a better teacher because I leave inspired and ready to return to the classroom and teach. It was an amazing day. 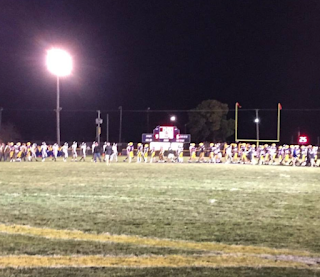 I rushed home from Peoria to make it for the High School football game. Part of me really just wanted to go to bed, but I love watching my former kids on the field. It was an amazing game, which we pulled out at the end to win 9-6. What an end to an amazing week!